scott's ravings: New Car Time? 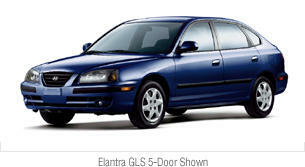 I've been thinking about getting a new car... thinking about the Hyundai Elantra. (Pictured below, in moonlit blue). It's a really reliable car. I like it because, to me, it looks like a Saab, but it costs like a Saturn. It has a 100,000 mi/10 yr warranty and lists for around $12k new. The hardest part is convincing Becky that (a) I can get rid of the 160k mi, 10 yr old Saturn even though it's still in perfectly good running condition, and (b) that we can afford it. I think if she had her way, I'd drive the Saturn for another year, and I honestly believe I could, but I don't want to anymore! Totally irrational, but that's the truth!